BRISBANE'S John Millman has vowed to produce the lofty standard of tennis which stunned Roger Federer this month when he proudly plays at his home city tournament in the summer. Millman today became the second player to confirm an entry for the Brisbane International from December 31-January 6, joining world No.1 Rafael Nadal. The 29-year-old Queenslander's rise in the rankings to No.37 with his win over 20-time Grand Slam title winner Federer to reach the quarter-finals of the US Open means that for the first time he will not need a wildcard or have to qualify for a Brisbane International. The seeds of that boilover win were watered at Pat Rafter Arena when he took Federer to three sets at the 2015 Brisbane International and also extended two-time major champion Andy Murray to three sets at Pat Rafter Arena in 2013. "I am really looking forward to coming back home next summer and playing in front of all the fans who gave me so much support during my US Open run," said Millman, who is having a few days off in Germany before resuming tour commitments in Asia. "There was so much excitement around Australia and I am determined to keep producing that level of tennis in Brisbane. "I didn't understand what it (the win over Federer) seems to have meant back home. But I hope to create other moments _ I'd like to make some runs in other tournaments, the Australian Open for example. If Millman's hip injury does not improve in the next few days, he said he would probably withdraw from next week's tournament he has entered in Chengdu, China. "If it looks like it will keep me out, then I'll probably pull out of Chengdu and start again in Tokyo (from October 1),'' he told couriermail.com.au. Millman had been ranked No.128 and needed a wildcard at the 2018 Brisbane International, where he took a second-round loss, again in three sets, to world No.3 Grigor Dimitrov. The Brisbane right-hander said he loved playing in Brisbane, but had also needed to battle nerves when playing in front of friends, family and supporters of his tennis career at the Brisbane academy of Tennis Australia, where he trains. "I'll continue to do what I've always done and fight in matches. I did what I do in every match and sometimes it doesn't work so much,'' he said. Brisbane International tournament director Cameron Pearson said big crowds would be inside Pat Rafter Arena for Millman's appearances. "Tennis became front page news when John pulled off that stunning win over Roger Federer," Pearson said. "I am delighted that John will be returning to the Brisbane International where his fans, old and new, can watch him compete against the best in the world." 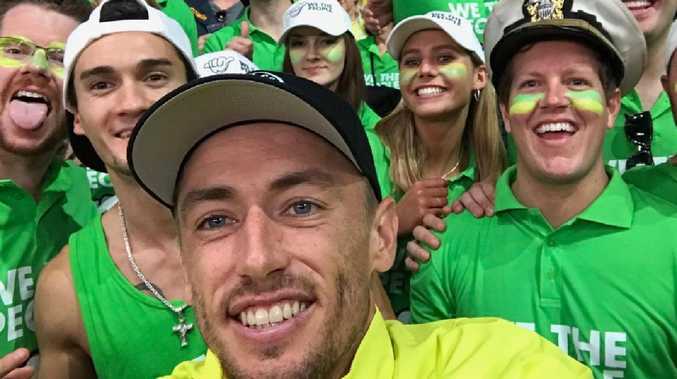 Millman was the highest ranked Australian player at the Davis Cup tie, lost 3-1 to Austria, last weekend and did not play on day one because of illness, according to team captain Lleyton Hewitt.